Regan Rosburg is inspired by the humble network of life that proliferates on the forest floor, in the shade, beneath the canopy of trees that sore above, blocking out the precious sunlight. The artist collects objects and insects from the deciduous forest of Northeastern Tennessee where she lives on a small farm with her fiancé. Regan left her native Colorado for Tennessee a little more than a year ago. Sheʼs inspired by her surroundings and the sound of her rooster talking to his hens. These recent works created for “Understory” reflect how those changes in her life are influencing her creative work. Regan grew up in the Black Forest near Monument, Colorado, where the evergreen trees are abundant, but the forest lacks deciduous foliage, rolling hills of grasses and naturally occurring flowers. For all its colorful slogans, Colorado is very brown compared to the thick, lush, greenness of Tennessee with its cycles, seasons and microcosms to be explored. Her parents were both teachers; her mom taught art at the Air Force Academy. Her father was a photographer on the side. She graduated from Lewis Palmer High School and switched her major from biology to art at the University of Colorado Boulder when she walked past the art studios and smelled the distinct scents of the materials. After earning her B.F.A. in painting and photography, she worked at several Boulder galleries before getting her first one-woman show. Natural resins — beeswax and tree sap — have been used in painting for centuries. But plastic resins can be highly toxic, are an imperfect medium and difficult to control. They were developed for use in the automotive industry, were used to craft surfboards and then adopted in the 1960s for use in fine art making. Tom Burrows creates abstract, color-field casts of resin. Damien Hirst uses resin to create his fly, butterfly and other paintings by embedding insect specimens in fine layers of resin. Sigmar Polke experimented with the chemical reactions of different materials with resin to create otherworldly abstractions. Fred Tomaselli and Rex Ray both utilize resin to collage together their highly involved and graphically detailed works. Itʼs a romantic version of nature, characterized by dynamic links among all living things that ignores the theories of survival of the fittest and natural selection. 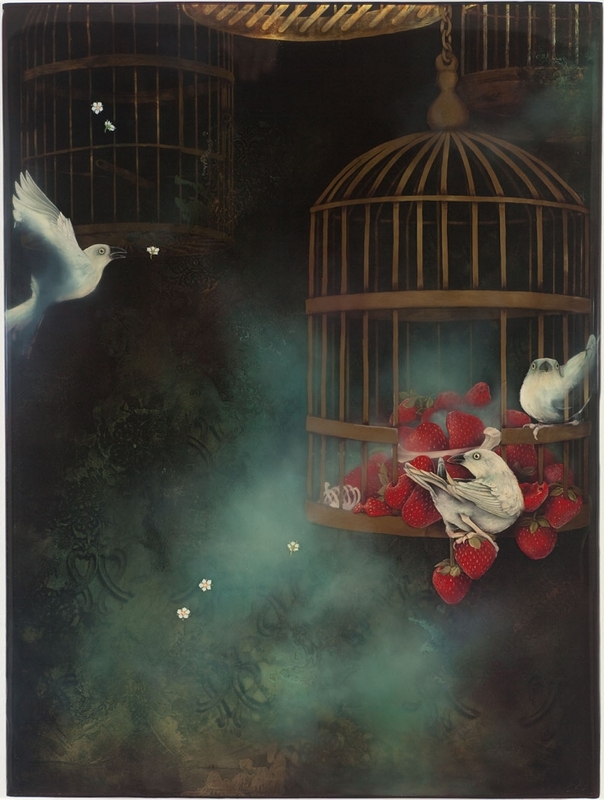 And that is what one sees initially when viewing her current body of work: beautiful, lush paintings, hinting at romance and Victorian ideals of nature. 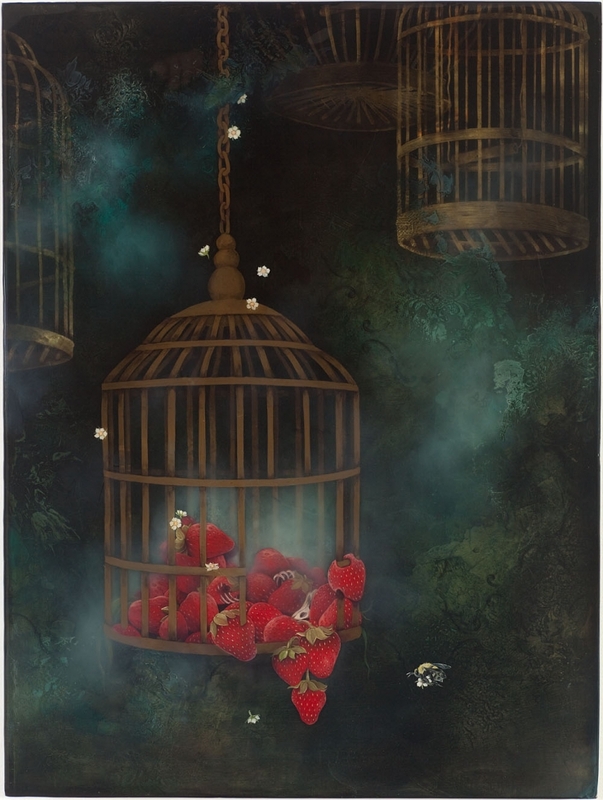 There are subtle layers of lace, wallpaper, drawings, prints or transfers, blades of grass, birds, berries and insects. However, upon closer examination, embedded in the layers of resin and paint are bones, trash, scorpions and black widow spiders, wasp nests, turtle shells, skeletons and lady bugs. The dichotomy of life and death, of beauty and truth, of human fabricated topiaries and natural wild grasses present a far more complex idea of nature. The titles of individual paintings, hint at the deeper meaning of each work. 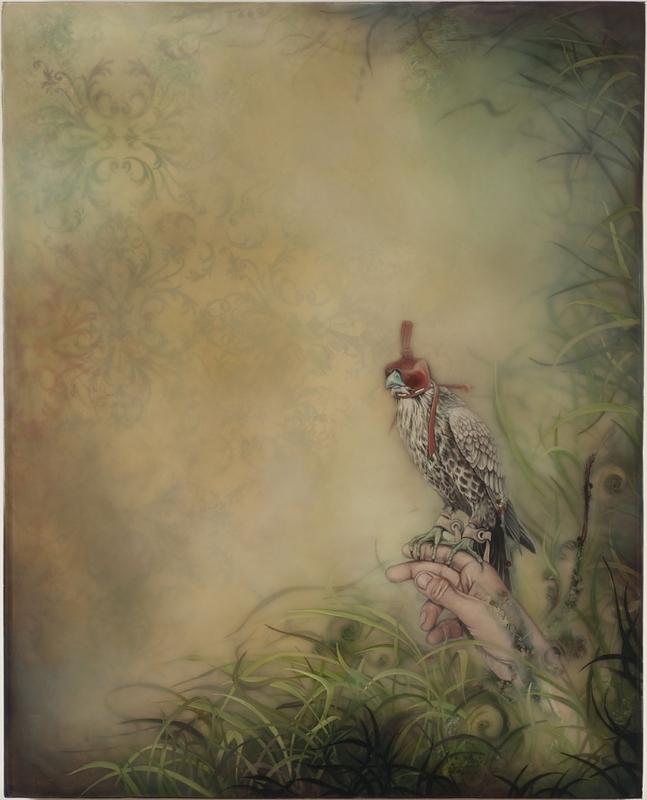 “Song of the Harbinger” is a large painting featuring a falcon with a mask on its head; a Harbinger foreshadows something that is coming. The painting is a blur of humanity, nature and trash. Something is coming, and perhaps we still have time to change, to make a difference, to adapt. The animals in this body of work are all doing something poetic, something meaningful. In “Sepulture,” the blue bird is giving another bird skeleton a proper burial, utilizing a tortoise shell, bits of leaves and butterfly wings. These composite paintings hold within them complex ideas and meanings about human society, materialism and how we interact with nature. The focus is on the beauty of nature. But in the end, this is an exhibition about resilience.